Can you believe 2018 is almost over? It seems like January was just last month! A few days ago I was thinking about all the habits I'd like to create in 2019 and all the action steps I would have to take to achieve them when I realised I don't need to wait for the new year to start doing these things, I could just start now. Why not start earlier? 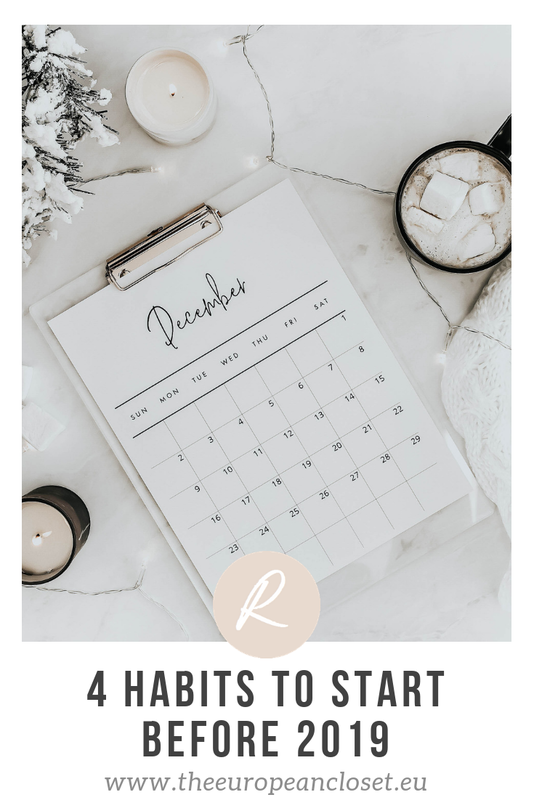 Today I've gathered 4 small habits you can start doing right now in order to achieve your goals in 2019. These 4 habits are not very specific, meaning they can help you achieve various goals. If you'd like to see a blog post where I talk about the action steps to a specific goal, let me know. When I say declutter, I don't mean you should go over every single thing you own and throw everything out unless 5 or 6 things (but if you want to do that it's totally fine), I mean you just make a habit of putting things back in their place. This will not only declutter your space but your min as well. I speak from experience when I say: an untidy space equals an untidy mind. Now it's the perfect time to start planning for 2019. If you haven't bought a planner yet, I'd suggest you buy one, or if you're not into paper planning, you should look for a good organisation app or calendar so you can organize all your thoughts and events. Again this doesn't have to be anything big: just make sure to try something you've never done before. It can be something as small as a new pasta recipe or something as big as learning a new language. It's time to become a more positive person. You know that whole 'half empty or half full glass'? This is actually a great metaphor if you think about it. Why think of a situation in a negative way when you can look at it positively?